What's the Difference Between a Router, a Wireless Router, and a Wireless Access Point? - Ask Leo! Terminology around routers and access points can be quite confusing. I'll describe each, how they relate, and why the differences matter. I’ve searched your archives and found articles on adding a router to a router. That’s the same as adding an access point, right? And it’s a common enough point of confusion that I want to clarify exactly what each is and why the difference might matter. A router is a networking device that … well … routes. Its job is to take data coming in one connection, or “port,” and send it to one of the devices connected to another. A router is considered an intelligent device. It can inspect the data being transferred and make changes to it. One example is when routers perform NAT, or Network Address Translation, which allows multiple computers to share a single internet IP address. Note that I’ve not used the word wireless. The functions of a router have nothing to do with wireless networking, and many routers have no wireless capability at all. A wireless access point, or “WAP,” provides wireless access to a network. A WAP acts very much like a hub in that it pays no attention to the data that crosses it. Its job is simple: send everything that comes in one “side” (wired or wireless) to the other (wireless or wired). Note that I have not used the word router in this description. A WAP is not a router, and does not provide the functions of a router. Here’s where the confusion arises. Because it’s so common to want both a router and a wireless access point, many equipment manufacturers have devices which do both. They place two separate devices — a router and an access point — into one box. It’s typically referred to as a wireless router because it’s a router with a wireless access point built in. Unfortunately, wireless routers are also frequently referred to simply as routers. By now, you know that’s technically incorrect. At best, it describes only half of what’s inside, and completely confuses the situation when you don’t know which of the two you’re referring to. If you have a router — wired or wireless — and you want to add to or extend your wireless network, you don’t want another router. You already have a router. You only need one router, and adding a second can confuse your networking. What you need is a wireless access point. You connect the wireless access point to your existing router using a cable. Here’s the really confusing part: you could use a wireless router instead of a wireless access point. It would work — sort of. The problem is the second router would, among other things, act as a firewall preventing machines on one side of it from seeing machines on the other side. It would also cause what’s known as “double NATing”, where the technique a router uses to allow multiple computers to share a single IP address would happen twice, once for each router. Some things would work, others would not. Some wireless routers can be dumbed down to act as if they were simple access points. Whether that’s possible, and what collection of options you’d have to select, depends on the specific model of wireless router you’re working with. Typically, it’s more confusion than it’s worth. If you’re just extending your wireless network or adding wireless capabilities to an existing network with a non-wireless router, an access point is what you want and all you need. 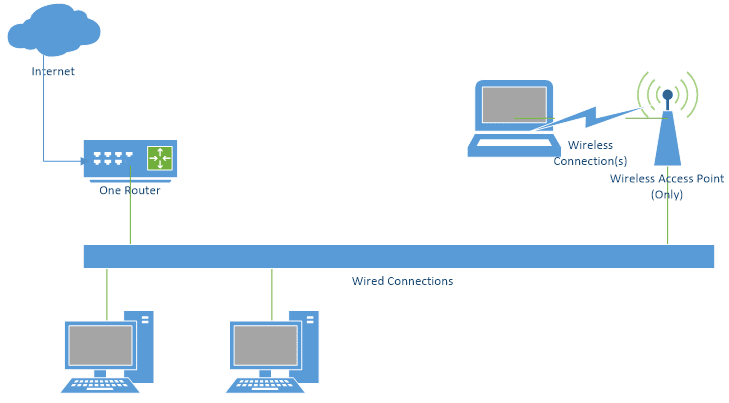 How Do I Best Extend My Wireless Network for Laptop Access? - It can be difficult to get wireless network coverage throughout your home. I'll look at a couple of ways to extend your wireless network. What’s the Difference between a Hub, a Switch, and a Router? - Hubs, switches, and routers are all computer networking devices with varying capabilities. Unfortunately, the terms are often misused. « Previous post: The concept seems simple: take a system image of one machine, restore it to another, and avoid lengthy setup time. Unfortunately, it’s not that simple. a wireless router and a wireless access point. just bought a smart tv:philips 7406.it can project movies from the pc to the pc.i have a stick installed in the pc and a programm installed in the pc.the problem is that it works(projects)not when i want it to work.it works occasionaly and i have no idea why? So, by definition, whenever some says access point, then they’re automatically talking about a wireless capable device, because an access point is, by definition, a wireless device. Right? I mean, otherwise, a non-wireless access point is just a switch. Right? It really wasn’t part of the question but switches and hubs add to the confusion for people and this would have been a good place to include them. Again ….your explanations are perfect! Good article – I bought my first laptop last month and has to wade through lots of manufacturers info to know I needed a wireless access point. I’m happy with the access point I chose, but maybe I’ll regret my choice in the future if my old faithful router fails. I wish you’d expand your “Some things would work, others would not.” comment further re using a combination wired – wireless router. Thanks Leo. Your answers make more sense of this issue to me now as I have a wireless router in my office at one end of the house and a (hard wired) access point at the other end to provide better wireless signal at that end. Interestingly, my laptop in the office picks up both signals but understandably (perhaps) uses the stronger signal (I think) from the wireless router in the office. Pretty clear to me now I guess. Thanks again. Some Wirless Access Points reguire that a antenna, be purchase separtely. And there a various type of antennas (such as omni and bidirectional, etc.). Anything that is wireless requires an antenna. Your phone, a GPS (receive only), your RF remote for satellite or cable box, garage door opener, etc. With the higher frequencies that many of these devices operate at, a functional antenna can be small enough to hide in the case of the device. A separate antenna can be larger and send/receive a stronger signal so that it works at a longer range. Most access points want an omnidirectional signal to cover everything near it. The other patterns extend the distance by aiming the signal. If you are in the direction of the beam, you get more distance. If you are not in the direction of the beam, you loose distance. An excellent presentation. The writing is clear and brief. I thank you for the information and the illustration of a router and an access point situation. I’m assuming I can go into an electronic store today and buy a wireless access point-only device. If so, what does a WAP-only device typically look like? I thought I found one at Frys.com. It’s called “Netgear Dual Band 802.11ac Wireless Access Point” — but it looked a lot like a router. Is that actually a wireless router? Also, is there any advantage to having the wired router and WAP as two separate devices instead of having them combined in a wireless router? A WAP can look like anything. It’s often a small box which looks like a router or a modem. Looks don’t have anything to do with it. I’d go by what the box says. I have a TP-Link router which has a switch to make it perform as a WAP. Mark, what model TP-Link router do you have? From a security standpoint, I like the idea of having a switch to easily turn on and off the WAP whenever you want. TL-MR3020 It’s a couple of years old so you might have to look for a newer similar model. It can also be used like a MiFi (a wireless router that acts as mobile Wi-Fi hotspot) if you plug in a USB surfstick. Unpluging the device is also an easy way to tun of WiFi access. It’s very important not to have 2 devices running DHCP and handing out network addresses. Fortunately the common way people (incorrectly) use two routers doesn’t cause this scenario. But yes, if present it can break your entire network.